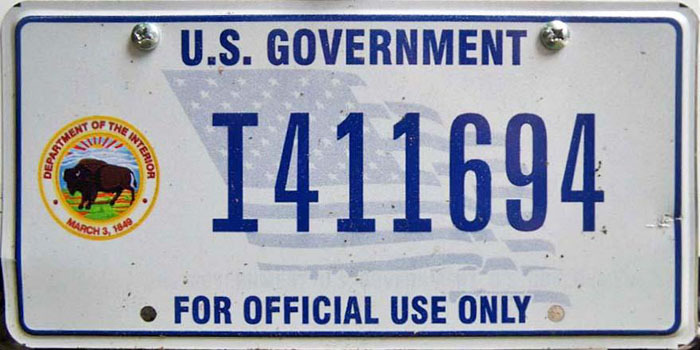 Although today's federal government plates have a uniform appearance, there are a large number of agencies and branches for which distinctive plates are issued, which might cause an observer to consider their distinctiveness similar to that of plates from different states. Prior to the adoption of a uniform plate design in 1942, although there were fewer agencies than today there were still enough of them that the number of plate types and styles is presently impossible to quantify, or even to estimate. Unfortunately there is no known authoritative documentation about the history of license plates displayed on U.S. government-owned vehicles, so most of what is known and documented on this page is based upon surviving examples and plates shown in photographs. 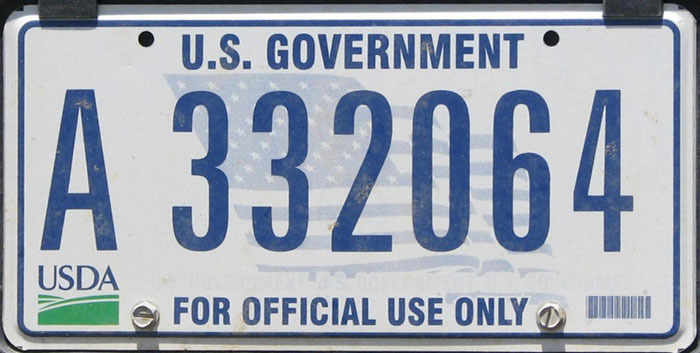 The earliest plates displayed on vehicles operated by federal government agencies were procured and issued independently of other agencies or a central federal vehicle registration office. A uniform plate was introduced in 1942, in some cases with agencies indicated by letter prefixes. This basic system is still used today. 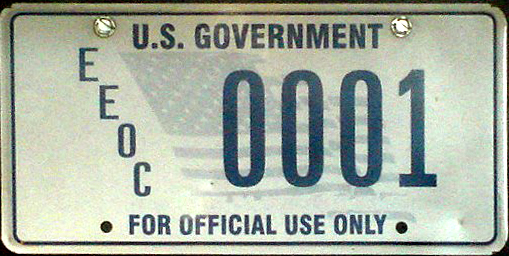 Separate from these federal plates is a relatively short-lived series of plates issued by the D.C. government for federally-owned vehicles. 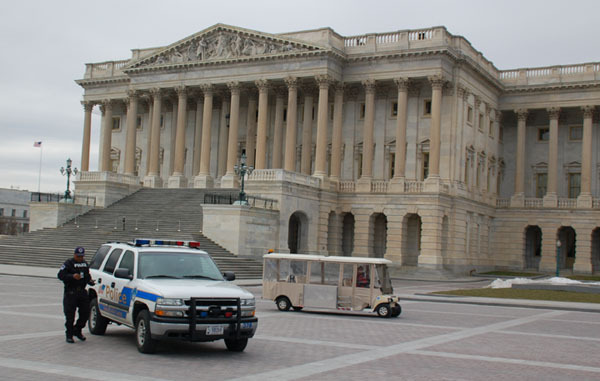 Exactly how these vehicles differed in their use and oversight from vehicles upon which distinctive U.S. government plates were displayed is unknown. When letter prefixes began to be used on District of Columbia license plates in 1927 the letter A was reserved for plates operated by the District and federal governments. (An example is shown here.) 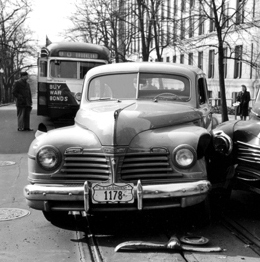 No evidence has been found to suggest that distinctively-marked D.C. plates were provided for government-owned vehicles prior to 1927. The types (D.C. and U.S. Government) had been separated by 1936, with the type name clearly embossed, a change that probably occurred in 1935 when the system of using letter prefixes to differentiate types was discarded. 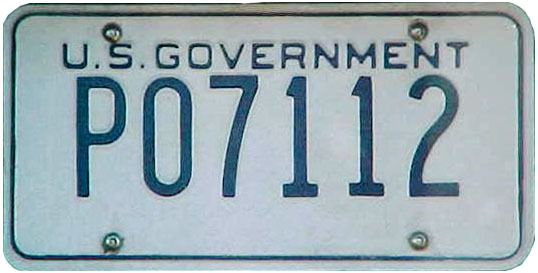 D.C.-issued plates for federal government vehicles of the 1950s and 1960s included slots to the right of the number into which were inserted one or two letter tabs to indicate the agency to which the vehicle was assigned. Based upon the spacing of plate number 9089 and the lack of agency tab slots, perhaps the agency was to have been indicated on a decal placed to the right of the number. The G in the prefix on plate no. 5256 indicates assignment by the General Services Administration to its Interagency Motor Pool System, and the 11 indicates use on an intermediate or subcompact passenger car. 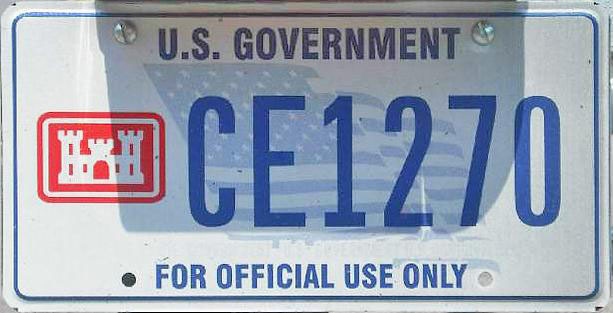 Special plates were issued for federal government vehicles in a relatively small number of the states, apparently mostly in the West. Note that the Arizona plate pictured was made 12 years after the U.S. Government began issuing its own uniform plates. The porcelain enamel California plate shown was used during 1919. Markers used to identify federally-owned vehicles may be segregated into three general categories: license plates, numbered permits, and unnumbered permits. Permits are not the primary evidence of vehicle registration, but supplement (and are usually attached to) the vehicle's license plate. We've made some assumptions as to whether certain numbered plates are license plates or permits based solely on their appearance, and welcome information and opinions on this subject. 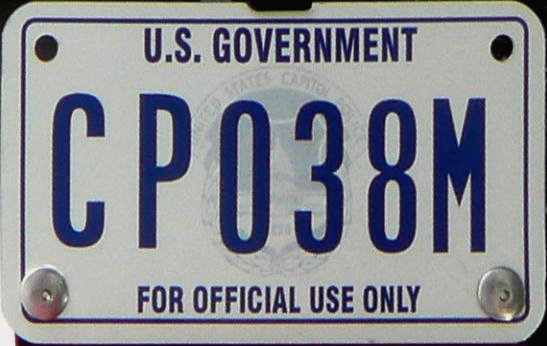 Like other permits, this U.S. Secret Service plate was used in conjunction with regular license plates when official business called for a vehicle to be conspicuously marked for government service. Pre-war photographs show these USSS permits being used on White House vehicles in which the president was a passenger. This particular example has metal strips fastened vertically on the back so that, according to a note taped to the back, it could be slid over and displayed in front of 1939 ("EX-2-29-40") D.C. auto plate no. 691. A few federal permits were issued for relatively short periods to indicate compliance with federal regulations. Interstate Commerce Commission (ICC). In 1935, Congress passed the Motor Carrier Act, which amended the Interstate Commerce Act of 1887 to regulate bus and trucking companies as common carriers. Compliance with provisions of the Motor Carrier Act was shown with large metal permits, displayed in addition to the vehicle's license plate, that includes the letters ICC and a serial number. For how long metal ICC permits were issued is unknown, but long after they were discontinued the ICC continued to regulate motor carriers until it was abolished in 1995, by which time this responsibility had been transferred to the U.S. Dept. of Transportation. National Recovery Act (NRA). The NRA was a New Deal agency created in 1933 designed to bring industry, labor, and government together to create "codes of fair competition" and set prices. The codes were intended to reduce what was perceived as "destructive competition" in various industries and to help workers by setting work and labor standards as well as prices at which goods could be sold. In 1935 the Supreme Court declared that the NRA law was unconstitutional, ruling that it infringed the separation of powers. Although the NRA quickly ceased operations in 1935, certain of its labor provisions resurfaced in the National Labor Relations Act, passed late in the year. The NRA symbol, the Blue Eagle, appeared on signs displayed in businesses within industries operating under a set of negotiated codes. For the trucking industry, permits were issued for display in addition to the vehicle's license plate. 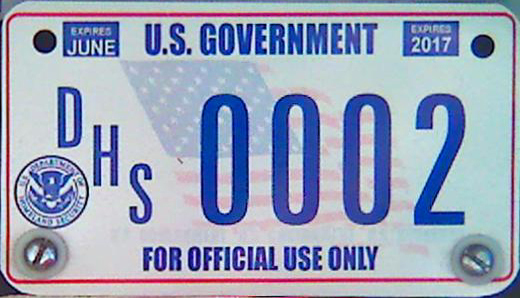 With just a few exceptions, including multi-year baseplates being introduced in the early 2010s, uniform license plates issued and used by the United States government have been undated and issued in relatively small quantities, making them difficult for today's hobbyist to date and collect. Plates that include DISTRICT OF COLUMBIA are considered to be D.C. plates, as opposed to federal plates to which the city name has been added, so the bases pictured above are not repeated below. 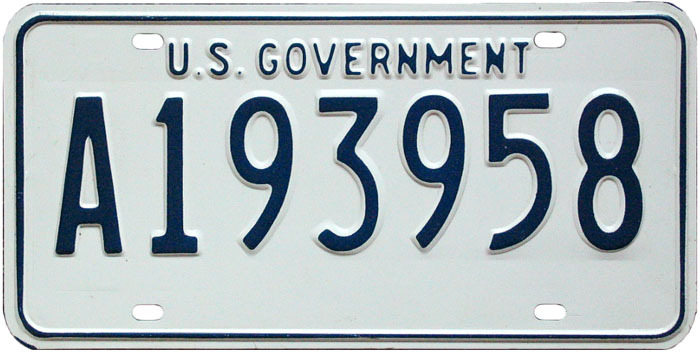 The 1942 issue is the first uniform federal government license plate. Our information about this plate comes from an Apr. 3, 1942, Washington Times-Herald article in which “Uncle Sam's new plates” are announced. At the time 19,000 pairs had been issued, out of a planned initial production run of 100,000. The 7"'x14" plates were made at Lorton Reformatory, where D.C. plates were made at the time. They are 20-gauge steel, a heavier material than used for plates intended to be used for only one year, because the intended period of use was five years. “Enameling is also extra heavy because we expect them to last the full life of the car,” said a spokesperson for the Bureau of the Budget, the predecessor agency to the current Office of Management and Budget. Numbering on these plates is either an all-number format or a one- or two-letter agency prefix followed by a serial number. The all-number plates are believed to have been equivalent to today's G-series Interagency Motor Pool series. Among letters observed on 1942 plates are A (Dept. of Agriculture), AE (Atomic Energy Commission), I (Dept. of the Interior), J (Justice Dept. ), and WA (possibly the Water Authority within the Dept. of Interior). Many others undoubtedly exist but a complete list of codes used on this base has not been identified. The largest initial order, 10,000 sets, was placed by the Army Corps of Engineers. All embossed features on some 1942 pates were painted dark blue before the registration number was masked and remaining features were painted again, this time in red, whereas on other plates there is no blue paint under the red. The two production methods provide noticeably different results. This base continued the tri-color format of the federal shield base but in a more traditional format. Validation tabs were used for at least one year, as shown on plate no. 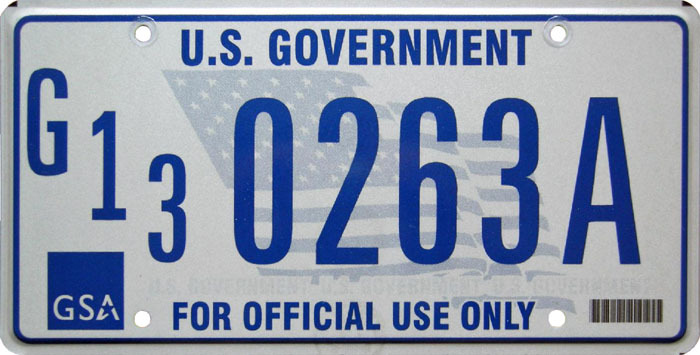 236, making it the earliest known uniform federal government plate with an expiration designation or any indication of its period of use. Dies used to make the Dept. of Agriculture and NATO plates pictured indicate that some plates of this base were made by Irwin-Hodson Co., of Portland, Oregon. Note their use of wide bolt slots instead of the small holes characteristic of Lorton-made plates. This base is known to have still been in use as of 1957. By early 1963 it had been replaced by the blue-on-white base. 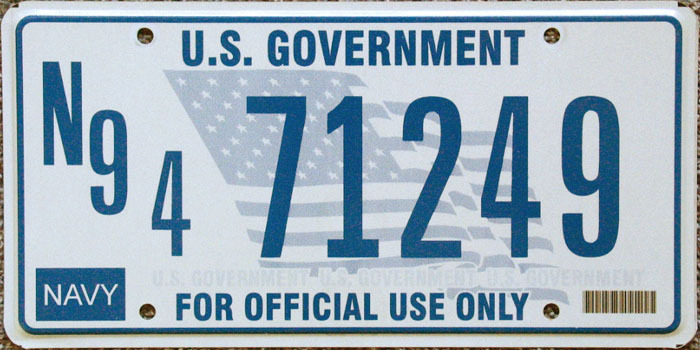 The longest-used federal government plate is the undated blue-on-white base, which was issued from the 1960s through Sept. 2001, with design variations made during that period such as the introduction of a reflective background. It was on this base that we first observed vehicle type codes used on the largest series of plates, those of the General Services Administration, which feature a G prefix followed by a two-number code to indicate the vehicle type. When this base was introduced is unknown, but it was in use by early 1963. The broad font for U.S. GOVERNMENT was used through the 1960s and most if not all of the 1970s. The smaller font, evident on plate no. A193958, had been introduced on plates with a painted (i.e. non-reflective) background by 1981. The background was later switched to reflective white. Completely flat plates made by the federal prison system's industries division, UNICOR, were introduced on October 1, 2001. There have been two variations of these plates, the 2001 and 2009 bases, both of which are made with DLP (Digital License Plate) technology. On both bases the size of registration number characters varies depending on the registration number format. 2001 Base. On earlier UNICOR-made plates the American flag background graphic is blue. These plates have a blue border and no expiration date. Additional examples are pictured within the prefix code list that appears below. 2009 Base. The flag graphic on more recent plates uses both red and blue, and there is a red border and an expiration date. 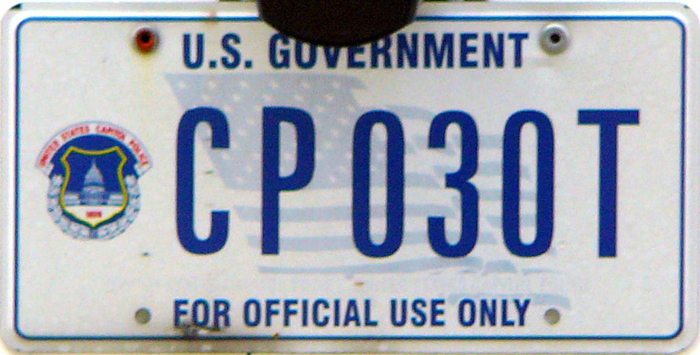 This plate style was introduced in 2008 or 2009 in conjunction with the 2008 creation of the Federal Motor Vehicle Registration System within the General Services Administration. These plates are marked with an expiration month and year that is eight years after the date of issuance. 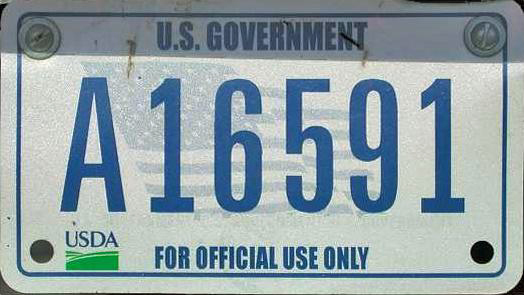 registered with GSA Interagency Motor Pool plates of the 2009 base. 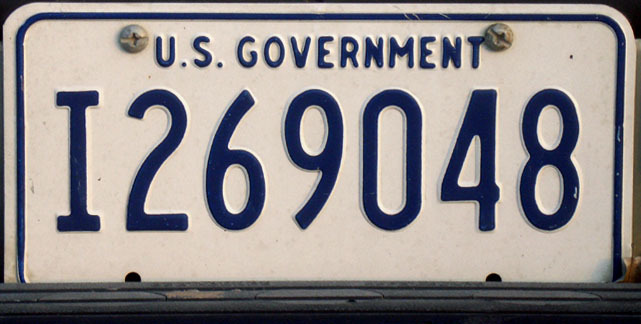 When uniform federal government plates were introduced in 1942, some were marked with a letter prefix to indicate the agency to which the vehicle was assigned. Today, all federal plates are numbered in this fashion. 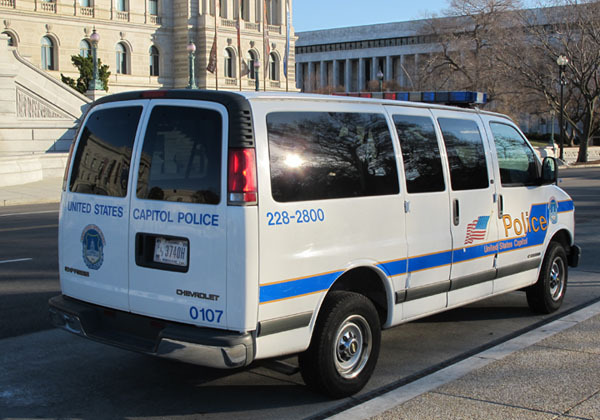 G-series plates, which are assigned by the General Services Administration (GSA) for its Interagency Motor Pool, comprise the majority of federal plates. GSA plates include a numeric code following the G prefix, presented diagonally, to indicate the vehicle type. Lists of the federal vehicle registration agency codes have been published throughout their 50+ years of use, and codes are added and removed from the roster of active codes as the structure of federal agencies is changed. When complete, this list will include all codes identified as ever having been used, but some may now be obsolete. Information presented in bold comes from a Jan. 2006 GSA list, the most recent list obtained directly from a government source. In instances in which more than one agency is listed for a single prefix code, the 2006 list code is the most current. Several of the single-letter codes date back to 1942, making them the oldest still in use. Small-format plates for use on motorcycles and trailers are made, although some trailers have been seen with regular plates on them, and there are also 6"x12" trailer plates. Distinctive federal government motorcycle plates presumably date back to 1942 but we only have photos of more recent examples. Numbering may be distinguished from regular plates with a type designation prefix or suffix letter.